Amazon has equipped its 10-inch Fire HD tablets with hands-free Alexa, effectively turning the tablet into a mobile Echo Dot. Whenever you call “Alexa”, the digital assistant appears like a genie from a bottle and attempts to help you using its artificial intelligence or control your smart home. In this brief review, we will be taking a quick look at the system. Which devices support Amazon Alexa? If you can deal with having ads on the lockscreen, the new Fire Tablet HD 10 (2017) only costs $149, while it still costs $165 sans ads. As such, it seems to be quite inexpensive. But when you think about the fact that this is basically an Amazon shopping cart, the price only seems fair. You don’t get certain freedoms on an Amazon device that you get on other Android tablets, and it’s particularly apparent in the severely limited selection of apps and services. I would describe the Amazon Fire Tablet HD 10’s (2017) design as sleek and functional. The tablet is almost a centimeter thick and has wide borders around its display. Amazon also bucks the trend when it comes to the choice in material: A good old-fashioned plastic body and a flat glass panel. A MicroSD slot can be found behind the flap. It is not intended to run on mobile data networks and as such, it is missing a slot for SIM cards, and there’s no eSIM soldered inside either. A 3.5-millimeter headphone port lets you connect analog headphones, and the micro-B port transfers data at USB 2.0 speeds and charges the battery at 9 watts. The Fire HD 10’s (2017) display has a classic 16:10 1,920 x 1,200 resolution display and has a pleasantly stable viewing angle with its IPS panel. If there’s a window behind you or wish to use your tablet in the daylight, the Amazon Fire HD 120 (2017) may disappoint you, since its brightness is not strong enough to counteract the glare.. Thanks to a software update, hands-free Alexa turns the Fire HD 10 (2017) into a mobile Echo Dot. The hotwords “Alexa” or “Amazon” wake the tablet up from standby mode, and it listens to your voice command. At home, the digital assistant then connects to compatible smart home devices. If you have already configured Alexa with another device, the Fire HD 10 simply takes the configuration from your Amazon account. If not, you can set up the digital assistant for the first time using your new tablet along with all the smart home functions. How to set up Amazon Echo Dot: Configuration, reset and Bluetooth connection. Initially, the pre-installed operating system on the Fire tablet, Fire OS, was at version 5.5.0.0 and is based on Android 5.1.1 Lollipop. During our review at the beginning of November 2017, we received an update to Fire OS 5.6.0.0, which delivered the aforementioned Alexa feature. However, due to heavy customization by the manufacturer, an Amazon tablet offers a severely limited Android user experience that you’re just going to have to deal with. If you’re coming from a device with a Google account or want to continue using services from your Android smartphone on your Amazon tablet, you can’t readily do so. Although you can install the Play Store if you really want to, it’s pretty tricky. However, the Fire HD will afterwards have true Google integration and even allow you to synchronize your Android smartphone and account with the tablet. Amazon designed the software to be a storefront window for its product range. You have a choice of e-readers, music and film streaming from proprietary services, audiobook and podcast players, and electronic issues of daily newspapers. Amazon Prime subscribers above all can enjoy their usual services that way, but if you live outside of this ecosystem, the Fire HD could prove disappointing for you. Apple Music, Google Play Music, Google Photos, Sky Ticket, and some other services that could be considered Amazon competitors cannot be found in the Amazon App Store, which would require the aforementioned trick with the Play Store. Or you can find the appropriate APK file and install it. Unlike normal Android, Amazon’s variant is equipped with comprehensive child protection. It locks app store purchases behind a PIN, makes Alexa unusable and restricts web browsing. Furthermore, you can specify times in which the device can be usable at all. The Fire HD is designed for streaming and e-books. Accordingly, its chipset is simple, and its gaming performance is sufficient for the few titles that you find in the app store. Its Wi-Fi unit supports all standards up to 802.11ac and ensures quick, smooth streaming. Overall performance on the Amazon tablet is pleasant, and there’s always a pause when switching between apps. However, there is no lag within the apps and as such, use is not negatively affected apart from slow multitasking. Thanks to its integrated stereo loudspeakers, the Fire tablet is very well suited for watching ordinary series. You will be able to follow dialog without any problems since the voices are reproduced clearly. However, Dolby Atmos does not have that truly atmospheric effect, since it lacks bass to do so, but you can always connect your trusty headphones to the headphone port. The rear camera is 2 megapixels and the front camera is 0.6 MP. And yes, you can use Skype on it. The Fire tablet has an excellent standby time clocking in at roughly one week. During active use at medium brightness, you can expect roughly 10 hours of on-screen time, according to our colleagues at TechRadar. Maximum brightness and continuous Wi-Fi streaming would knock a few hours of this number. 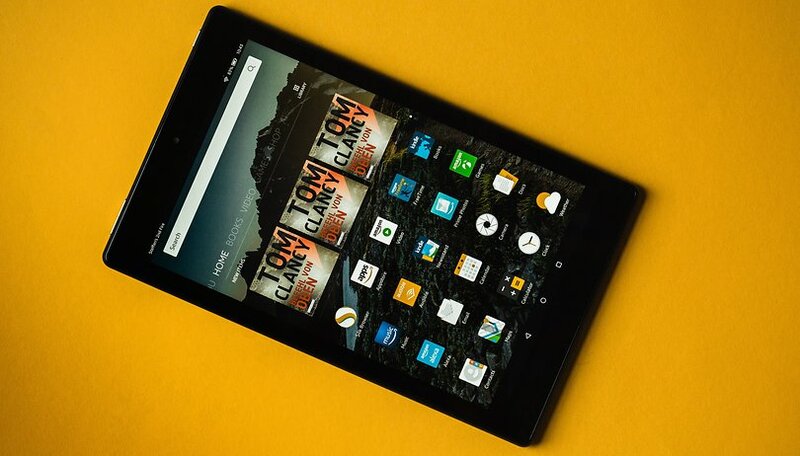 If you can deal with the software’s peculiarities, you will be happy with the Fire Tablet HD 10. One benefit of the 2017 models is undoubtedly the Alexa integration, which turns the tablet into a mobile Echo Dot and thus, a voice remote control for your smart home. Otherwise, Amazon retains the characteristics of its Fire series: The tablet is very affordable, although it is more of a digital shopping cart than a standalone product.